L. Baratchart, J. Leblond, D. Ponomarev, "Solution of a homogeneous version of Love type integral equation in different asymptotic regimes" [accepted in IMSE 2018 Proceedings], October 2018. L. Bourgeois, J. Dardé, D. Ponomarev, "An inverse obstacle problem for the wave equation in a finite time domain" , Inverse Problems and Imaging, 13 (2), 377-400, 2018. L. Baratchart, J. Leblond, E. Lima, D. Ponomarev, "Magnetization moment recovery using Kelvin transformation and Fourier analysis" , Journal of Physics: Conf. Ser., 904, 2017. J. Leblond, D. Ponomarev, "On some extremal problems for analytic functions with constraints on real or imaginary parts" , Advances in Complex Analysis and Operator Theory [Festschrift in Honor of Daniel Alpay's 60th Birthday], 219-236, 2017. J. Leblond, D. Ponomarev, "Recovery of analytic functions with prescribed pointwise values on the disk from partial boundary data" , J. Inverse Ill-Posed Probl., 25 (2), 2017. L. Baratchart, J. Leblond, D. Ponomarev, "Constrained optimization in classes of analytic functions with prescribed pointwise values" , arXiv preprint, July 2014. D. Pelinovsky, D. Ponomarev, "Justification of a nonlinear Schrödinger model for laser beams in photopolymers" , Z. Angew. Math. Phys., 65, 405-433, 2014. D. Ponomarev, S. Leble, "Molecular zero-range potential method and its application to cyclic structures", arXiv preprint , January 2011. S. Leble, D. Ponomarev, "Dressing of zero-range potentials into realistic molecular potentials of finite range" , Task Quarterly, 14, 29-34, 2010. D. Ponomarev, O. Nagornov, "On effective wave propagation characteristics in porous fluid-saturated medium containing fluid inclusions" , Geophys. J. Int., 182 (2), 1043-1057, 2010. D. Ponomarev, "High-order time integration Leap-Frog schemes combined with a Discontinuous Galerkin method for the solution of the Maxwell equations" , INRIA preprint, October 2009. O. Nagornov, D. Ponomarev, "Plane wave scattering on spherical inclusions of different types in fluid-saturated porous media" [accepted with minor revisions in Mechanics of Solids; in Russian], September 2009. "On transformation of Schrodinger equation to a simple first order equation with complex conjugation: theoretical and practical applications". "Asymptotic spectral computations for integral operators with even kernel on small and large intervals". "Spectral analysis of one-dimensional truncated Poisson operator" (with J. Leblond, L. Baratchart). "Recovery of magnetization features from partial field measurements: Fourier and Kelvin transforms approaches" (with J. Leblond, L. Baratchart, E. Lima). "On asymptotic extension of convolution theorem for Fourier cosine transform for certain integral equations on half-line". "New method for construction of asymptotic solution for Prandtl lifting line equation". "Some inverse problems with partial data", Ph.D. Thesis , Université Nice - Sophia Antipolis / INRIA Méditerranée, France, defended on 14/06/2016, supervised by Juliette Leblond, Laurent Baratchart. "Justification of a nonlinear Schrödinger model for polymers", M.Sc. 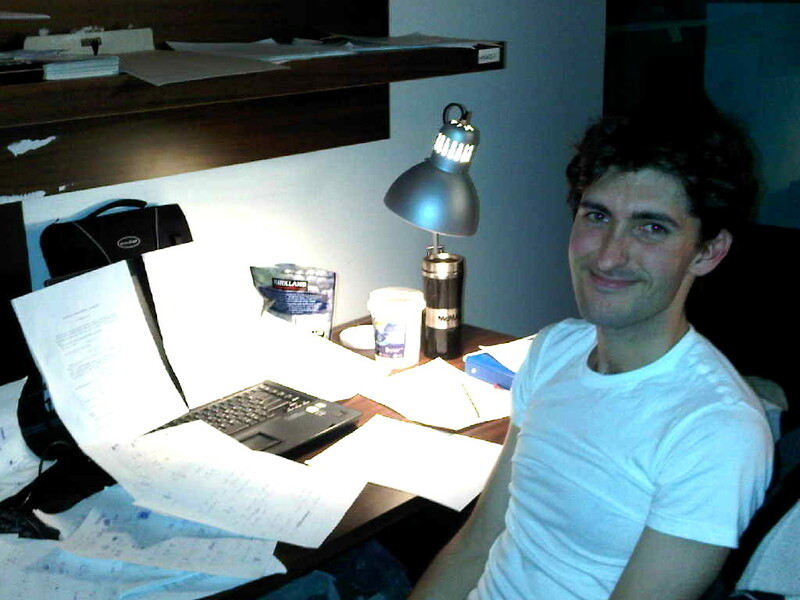 Thesis , McMaster University [Department of Mathematics and Statistics], Canada, defended on 03/05/2012, supervised by Dmitry Pelinovsky. "Electronic states in Zero-Range Potential models of nanostructures with a cyclic symmetry", M.Sc. Thesis , Gdansk University of Technology [Faculty of Theoretical Physics and Applied Mathematics], Poland, defended on 22/06/2010, supervised by Sergey Leble.